Most Americans are probably aware that October is Breast Cancer Awareness Month, something especially evident in our sports culture. Notice a lot of your favorite NFL players wearing a bit more pink these days? It’s the league’s nod toward this high-visibility cause. MMA has its own beacon of awareness in UFC light heavyweight Phil Davis. The world’s largest MMA organization didn’t tell Davis to wear pink trunks but rather it was Davis’ decision to don a color not exactly associated with a tough guy sport. He does so to honor his mom and his late aunt who battled cancer. After getting a lead from my editor, I interviewed Davis for October’s FIGHT! Magazine (available on newsstands with Carlos Condit on the cover) about how he came to the decision, what cancer has done to his family and what’s going on with his career. This was definitely a last-minute story idea, written over Labor Day weekend with the interview done in my car on the way up to Maine and the piece written the next day. This isn’t anything new for journalists/feature writers, but it’s still fun to take people behind the curtain. Pick up the magazine, follow Phil on Twitter and if you like my writing, check out my WrestlingObserver MMA interview series with Bryan Alvarez, my weekly show with PJ Huot on WGAM/ESPN Radio NH or my work on Bloody Elbow. Everyone loves a comeback story, especially a writer. That’s why I really enjoyed getting the green light to write a feature on Alan Belcher for the September issue of FIGHT! Magazine, available now. Belcher competes in the UFC’s 185-pound division and had a really nice career going until an eye injury sidelined him for 16 months. After a little scare, Belcher is back and returns to action Saturday, September 17th at UFC Fight Night event on Spike TV. In interviewing him, one of the really cool things I learned is he’s growing an MMA empire down in Mississippi with the Alan Belcher MMA Club. He told me his kickboxing signups for June were among the highest in the country and he’s got nearly 30 employees — something many gym owners would drool at having. Sometimes I worry about the future of those pro athletes who simply don’t know anything other than the sport they play. I’m not talking about the megastars or even the next level down. I’m talking about the prospects that get some decent bonuses, have some success and then are dropped with no chance of a comeback. I worked in pro hockey for a long, long time and saw kids come and go that were absolutely screwed once their playing days were behind them. Without any common sense and a lifetime of having people help them out, many find themselves among society’s most useless assets: entitled without a reason to be so. I find that MMA athletes, however, are in much better positions. I think it’s the martial arts background and upbringing, but MMA athletes are truly cut from a different cloth. Belcher is among those destroying the assumption that fighters are just savages in the cage and little else. He’s a smart guy, as is Mike Swick who I interviewed for August’s FIGHT!. Swick and Roger Huerta are opening up a full MMA school in Thailand and have been busting it out to get it done. Those are just two examples in a sea of guy who value a dollar. Initially, Belcher was a little difficult to track down because of a crazy schedule, but every time someone answered the phone at the gym, they were friendly and nice. (That’s a good note for any business, by the way.) Overall, the feature was a positive experience and I hope he does well Saturday and in the future. He’s got plenty of time left to get back in the title mix and if it doesn’t happen, I think he’ll be alright. 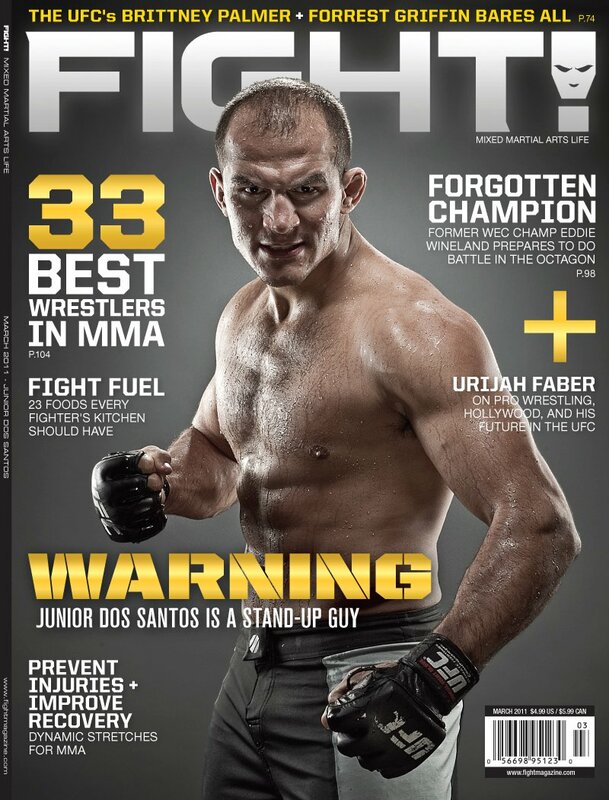 Plenty of other great features in the issue including the cover story on former WEC 135-pound champ Brian Bowles, Bellator 155-pound champ Eddie Alvarez, Versus reporter Molly Qerim and tons more. 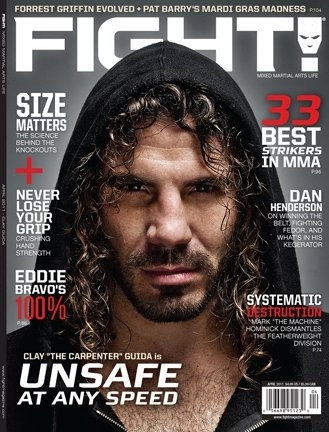 One of the true joys in my writing career is my role as a contributing freelance writer for FIGHT! 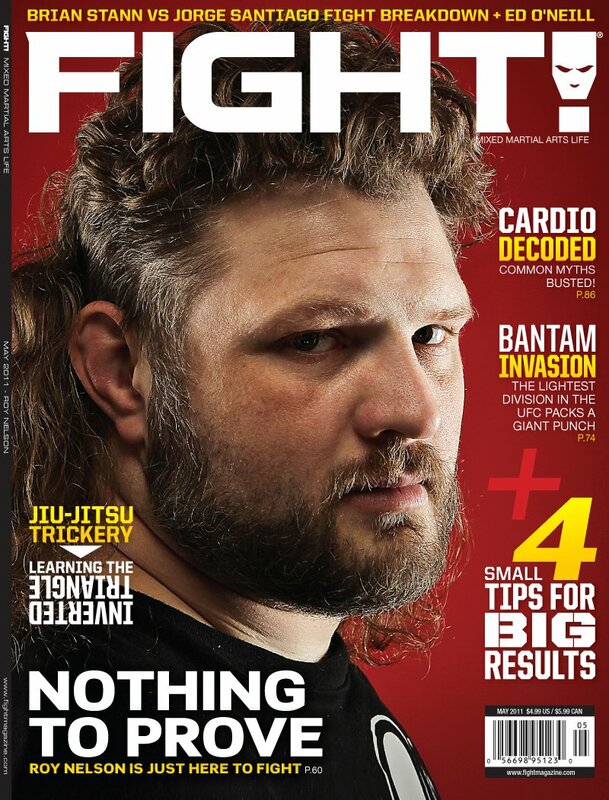 Magazine, the industry’s top magazine for mixed martial arts (aka the UFC for you noobs). It looks slick, it’s well-respected and they pay me. Win win all around! One of the unique things about writing for print media is that you lose the timing aspect you get in today’s internet world. This month’s feature on UFC middleweight Mike Swick is a great example of that. I have to submit my articles roughly 5-8 weeks before they see the light of ink and page day. A lot can happen in anyone’s life in a month’s time so part of the game is hoping that nothing too crazy changes between the time of submission to the time of print. Mike was set to fight at this Saturday’s UFC event in Brazil, 18 months after he last competed due to multiple injuries and a bizarre confluence of stomach issues that essentially made his body work against him. As bad luck would have it, Mike hurt his knee and is undergoing surgery that took him out of the fight. 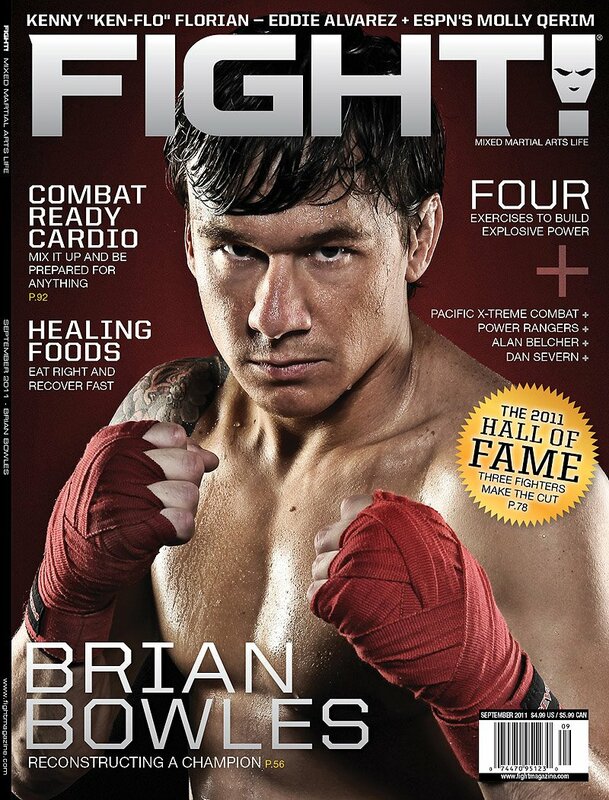 Of course, the August issue of FIGHT! hit stands with an awesome three-page layout with part of the focus on this comeback fight. I’m still proud of the feature and believe in it fully, but it kinda stings that the focus of the article had to pull out. Welcome to the print journalism world, folks. 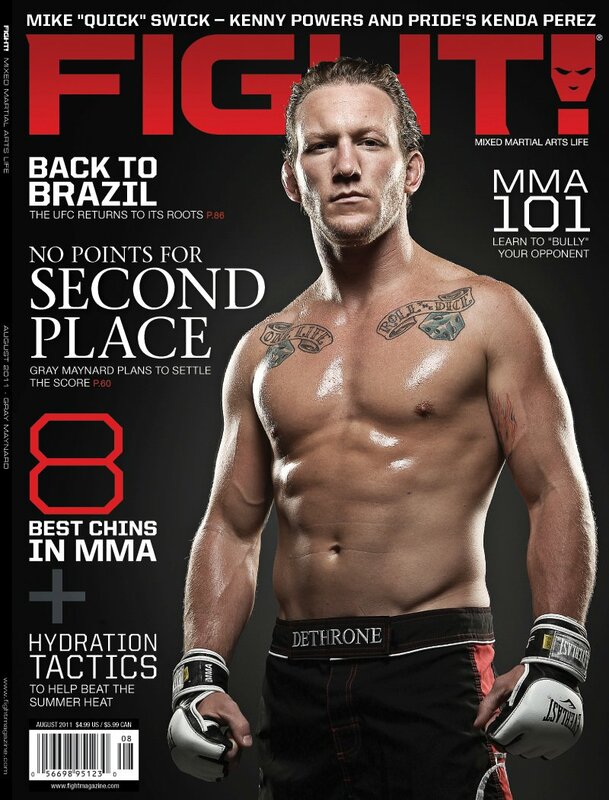 In any case, pick up the issue which also features a great cover story by Chuck Mindenhall on Gray Maynard. Seriously, it’s awesome. I’ll always feel kinship to my friends at the Fight Network in Toronto, Canada — the same group where I had some of my first major radio interviews back in the day. One of the people I used to chat with is John Pollock, who is a fixture on the network and hosts a series of podcasts about combat sports. It’s been quite a while since I was on the show (March!) so I was glad to get a text from John Thursday night asking if I could come on the show and talk the UFC deal with Fox. We talked for nearly 30 minutes and I actually got a great column idea out of the interview. I love when that happens! Here’s the interview. Skip ahead to 70 minutes in to hear myself and John unless you want to listen to a review of TNA Impact. – In my real world job, I’m really liking my role as “editor in chief” of Dyn.com. We recently relaunched our entire site and rewrote/restructured all of the content, which was quite an exercise. To some, relaunching a site isn’t a big deal but when you consider we were combining major traffic from a sister site into this one, it was a pretty big freakin’ deal. Our email program is next up for review and some Nason-izing. – I continue to drop in every few weeks on BloodyElbow.com with a guest editorial or quick-hit news bit. I actually kinda like the guest writer role as I stay free of commitments but still have a presence on one of the most heavily-trafficked MMA sites on the interwebs. Here’s my latest for BE on my ideal UFC debut on Fox. – I wrote an homage to Maura Tierney amidst a lot of bitching about Rescue Me. – I still need to do something up on Grantland. The fact I don’t go there as much as expected is telling. – Finally, the WGAM MMA Show keeps plugging along. I feel like we’re putting out a great product but we need more people to listen. (Duh statement, right?) It’s a crowded market for MMA podcasts and shows, but we’re really close to a breakthrough. We have UFC fighters on nearly every week and have talked to some big names. Still, we’re at 12 likes on Facebook as of this writing which drives me slightly crazy. Damn social media. I might be a diehard New England Patriots fan, but sometimes work takes precedent. I ventured into enemy territory several months ago in chatting with Pittsburgh Steelers All-Pro linebacker LaMarr Woodley for a feature in May’s FIGHT! Magazine. Woodley was a bit easier to track down than Tim Thomas, simply because Woodley is in his offseason — a locked out one at that. We chatted while he was in Michigan on family business and talked about what attracted him to the sport, his training in Florida and being a part of UFC 100. He’s a good dude and I joked with him a bit over text about whether LaMarr vs. Lesnar would be a great main event (he has no interest in that or any other fight). Follow LaMarr on Twitter, yet another pro athlete who loves, respects and understands MMA and wants to be involved. We can’t have enough of those guys around. Josh Nason is a freelance MMA journalist who contributes to FIGHT! Magazine, WrestlingObserver.com, BloodyElbow.com and several radio shows/podcasts. Follow him on Twitter: @JoshNason. If you love hockey and MMA, I am fairly confident you’ll like my interview with Boston Bruins goalie Tim Thomas in April’s FIGHT! Magazine. The story of how it happened is quite something as well. I remember reading an Ariel Helwani Q & A several years ago on Thomas and wanted to do more of a feature piece on him for FIGHT!. I pitched, they accepted and off we went. But pro athletes in the “traditional” sports are a bit tougher to track down than their MMA counterparts, sometimes to a maddening degree. Thankfully, this wasn’t the case but it still took a while. I used to work for a pro hockey team and understand the athlete’s workday pretty well. There’s a lot of hard work but there’s a lot of downtime too. I was glad to be able to work everything out, which is more than I can say for another Boston team that I was attempting to work with. That story will hopefully have a happy ending…someday in 2015. After leaving several messages on voicemail and getting nowhere, I took to Twitter (of course!) and asked if anyone could help out. I hate doing biz in public like that, but desperate times call for desperate social media efforts. And hey, it worked! The next day, I got an email/call from Eric in their PR department and after several months of trying to figure out a good time for a phone call, we found a window when the team was in Vanouver on a long layoff. Tim called me on a late-Thursday afternoon and we had a great 30-minute chat about his love of MMA, where it came from and basically anything but hockey. Having worked in the sport for so long, I knew it was going to be fun. Hockey players are very similar to MMA talent in that they are tough dudes who enjoy being tough dudes. For the most part, they can have normal conversations like most normal people and that’s refreshing. The shifting of conversation away from hockey was done by design as Thomas and many other athletes talk about their professions constantly. Especially in the Boston media, they are doing interviews non-stop about the same subject over and over and over again. I thought it’d be a nice break for Thomas to discuss something other than the ice, even though we did chat a bit about his scrap with Montreal goalie Carey Price earlier this season. So I encourage you to pick up April’s FIGHT! and check out the feature, along with the other great writing in there. As always, let me know what you think and be on the lookout for another big athlete piece in May’s FIGHT! as well. With all of the attention focused on Urijah Faber in this Saturday’s UFC 128 co-main event, Eddie Wineland has been left in the dust. Is that a way to treat the first-ever WEC Bantamweight Champion? Yep, Wineland was the first. Bet you didn’t know that. However, for this and more awesome details on Wineland, read my feature on the man who wants to take apart Faber in the March edition of FIGHT! Magazine. By the way, my story made the cover. See? 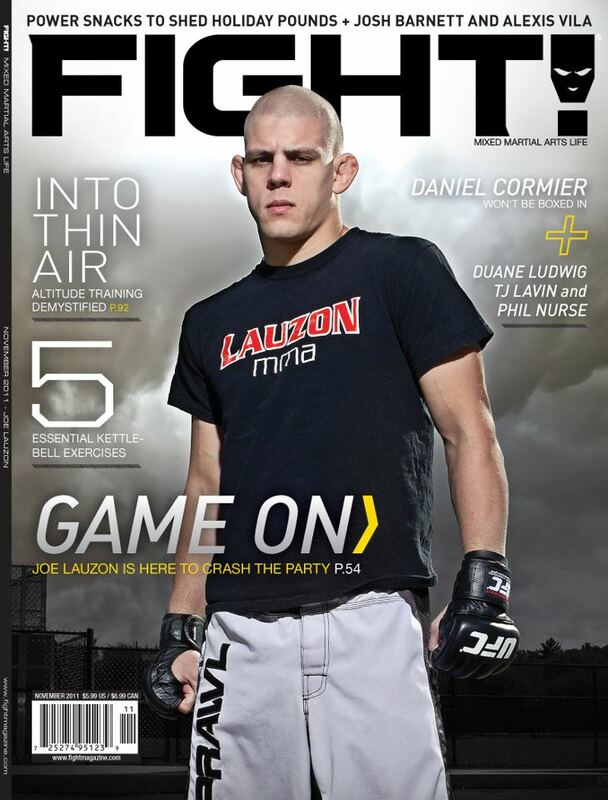 Josh Nason is a New England-based freelance MMA journalist that has an Eddie Wineland feature in March’s FIGHT! Magazine. He frequently does radio/podcast appearances and asks for your “like” for ESPN Boston to cover MMA. Follow him on Twitter.